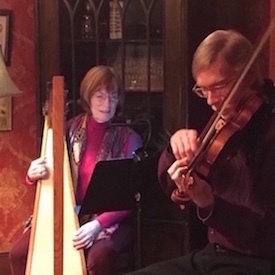 The duo Fiddle & Harp performs Celtic and American tunes for all occasions. Offering: $40 per person (includes wine & cheese and buffet 'surf & turf' dinner). Join us for a delightful ‘date night’ including a wealth of great pairings. Our presenters for the evening are a great pair themselves, Marcie and Gordon Swift. They'll share tales about how they met and how music later tightened the bonds between them and will perform selections from their recently released CD, The Heart is True. Together this married couple demonstrates the unifying, intimate power of music as refuge from a chaotic world. Register here. Please support Soroptimist and enjoy a three course meal along with a performance by Fiddle & Harp. This global volunteer organization improves the lives of women and girls through programs leading to social and economic empowerment. 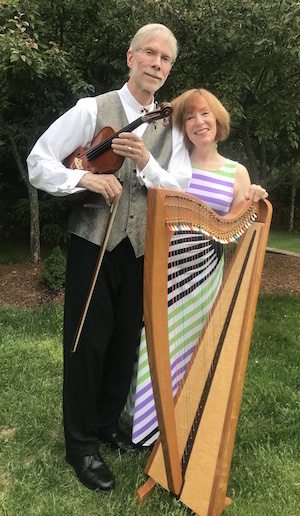 Fiddle & Harp will add to the festivities with Celtic and American tunes. The price is $50.00 per person including service, with profits benefiting Soroptimist. Dietary issues may be accommodated. Please call 860.651.1908 for reservations. For information and bookings contact Marcie at (860) 670-0452 or marcieswift@msn.com. 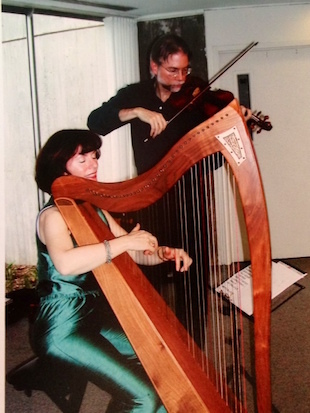 To learn about Marcie's healing harp, including her workshops and retreats at Copper Beech Institute, visit marcieswift.com.